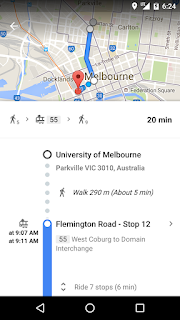 For example, the next time you’re planning a trip between the University of Melbourne and Southern Cross Station, you can simply type in the two locations to get information about which tram to catch. 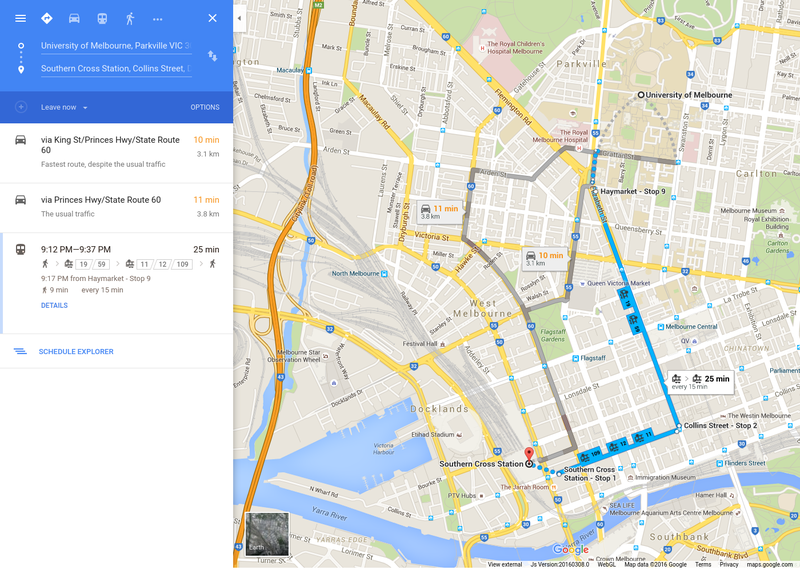 With the new version of Google Maps, you can also compare different public transport options to work out when you need to leave to arrive at your destination on time. 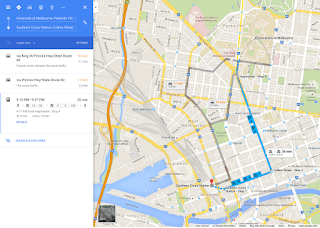 We hope Google Transit in Melbourne will make it easier for you to plan your next journey and will help give you more time to explore what Melbourne has to offer. 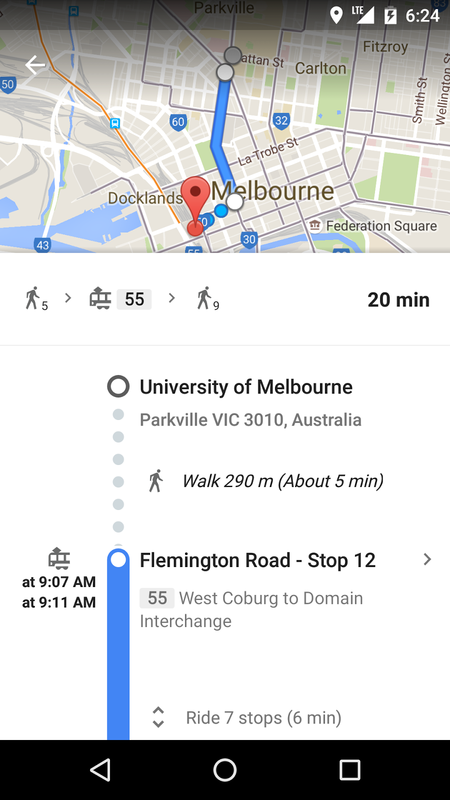 Starting today, commuters in Melbourne can use Google Transit to make planning their journey around the city easier and faster. We’ve teamed up with PTV to add information about stops, routes and schedules for Melbourne buses, coaches, trams and trains on Google Maps. More than 40 teams - including 16 from regional Australia - sent their robots into battle, storming each others’ fortresses and using a combination of guile, strength and ballistics in a bid to score the most points over two days of loud, high-energy competition. Prime Minister Malcolm Turnbull and Foreign Minister Julie Bishop walked amongst the teams on the final day, learning about robotics from the kids and getting up close to the battles. Local federal MP Craig Laundy, the assistant minister for multicultural affairs, and federal Labor MPs Terri Butler and Julie Owen also visited the competition. The FIRST Awards recognise design excellence, competitive play, sportsmanship and entrepreneurship. This year we were really encouraged to see a record number of girls competing. To celebrate this we continued the tradition of hosting a FIRST Ladies breakfast to help grow this amazing community of young women. 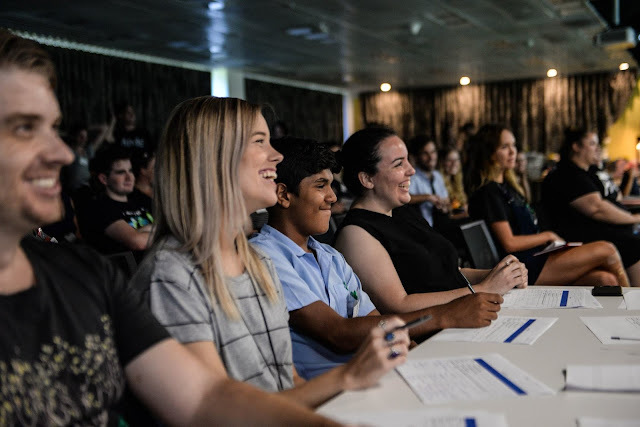 Google has long supported FIRST and, together with Macquarie University, we are thrilled to help bring this competition to Australia and encourage more young women and men to get involved in science, technology, engineering and mathematics (STEM). These fields teach students the computational skills they will need for the economy of the future - whether they end up working in computer science, banking, medicine or any number of other fields that are being transformed by technology. More than STEM skills the program also develops leadership, resilience, confidence and teamwork - all vital for building an innovation generation. Students participating in FIRST are far more likely to study science, technology, engineering or mathematics at university. This is especially important for Australia, where our Chief Scientist has identified that Australia lags the world on STEM. Building a robot is a lot of fun. It's also a vital part of preparing our kids for the jobs of the future. To find out how to get involved, click here. What could be more fun than a mash-up of robots and castles? Well, perhaps only the addition of hundreds of school kids from Australia, Asia and America, who descended on Sydney Olympic Park last weekend for the FIRST Robotics APAC Regional Competition. Today, we’re making the YouTube Gaming mobile app available on iOS and Android in Australia. YouTube Gaming is an app that keeps you connected to the games, players, and culture that matter to you, with videos, live streams, and the biggest community of gamers on the web—all in one place. We launched YouTube Gaming in the U.S. and U.K. last August, and today we’re inviting new players in Australia and New Zealand to join us. with the skills they need for digital technologies curriculum - for free. Women like Dr Linda McIver who after completing her PhD in Computer Science went into teaching in High School to inspire the next generation of creators. Women like Dr Jenine Beekhuyzen founder of the Tech Girls Movement who is inspiring young girls around the world to get involved. Currently women in computer science make up around 18% of the workforce in Australia. Yet we know that 75% of all future jobs will require STEM skills and the vast majority of them technical skills like computer science. 2015 application and offer stats show that out of all the applications by women to study at university, only 3% of applications were for IT. We need to shine a light on women in the industry as an example and role model for the women to come. That’s why we are delighted to be partnering with the Tech Girls Movement to inspire and equip more young women to pursue a path to a career in technology. It’s exciting to see what is possible if you just provide the inspiration and pathway. When we come together to support a movement like this, we equip and inspire future generations of women to lead in our industry. This week we announced we are extending this relationship and helping the Tech Girls Movement to put a copy of the new Tech Girls are Superheros book in every classroom in Australia. We want girls to be able to see that tech is exciting and fun, and it is for them. The current crop of tech girl superheroes featured in the book. We are also partnering with the Tech Girls Movement to fund workshops for more than 150 teachers to equip them with the skills they need to encourage young women in their classes to join the search for the next Search for Tech Girl Superhero program this year. This hands on program is a fantastic way to teach girls technology and entrepreneurship and inspire them to design their own future. 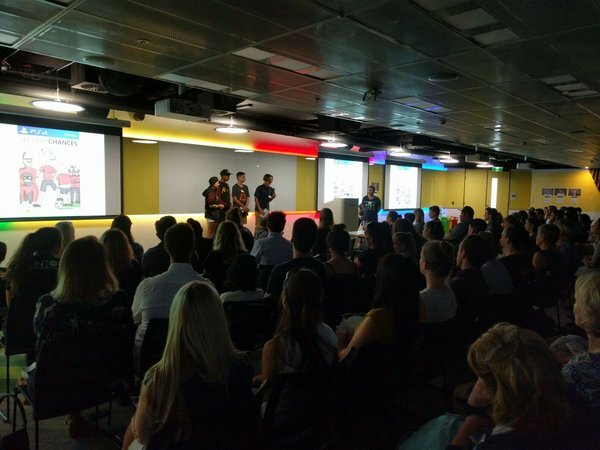 We’re also putting up our hands to work too, and we’ll be inviting every Googler in Australia to volunteer to help mentor a team and inspire them to fulfill their dream. We hope that one day we’ll see these young women building the next Google right here in Australia. Emma Yap, 9, demoing her carpooling app which lets parents who are verified by schools arrange rides with each other on week days and for weekend activities to Alan Noble, Engineering Director Google Australia. It takes an entire community to make a change this big. We want to invite you to get involved. To join the movement. Help spread the word to your old school, to your networks, in your community. Sign up to mentor a team. Start a team. Help fund a donation of books to your school. Be a part of building a future where women are well represented in the tech community. Women have been at the heart of computer science since the very beginning, but if you asked girls in our schools today to name any female computer science heroes, it’s unlikely that they’d be able to. That’s why it’s important for us to celebrate women in our industry, and to shine a spotlight on the contributions to society of women all around the world. This year on International Women’s Day, a group gathered in Google Sydney’s office to shine a light on the women who are superheroes in the tech industry. Women like Ada Lovelace, Grace Hopper, Barbara Liskov, Radia Perlman, Karen Spark-Jones, Kay Antonelli and Anita Borg are just a few. But it’s not just these women we came together to celebrate. We wanted to celebrate those in Australia who are working to inspire young women and girls to choose computer science and technology careers. Women like Associate Professor Katrina Falkner at the University of Adelaide who is changing primary school education nationally by equipping teachers with the skills they need for digital technologies curriculum - for free. Women like Dr Linda McIver who after completing her PhD in Computer Science went into teaching in High School to inspire the next generation of creators. Women like Dr Jenine Beekhuyzen founder of the Tech Girls Movement who is inspiring young girls around the world to get involved. Thanks to the best in the business game designers and computer engineers from the Academy of Interactive Entertainment (AIE) who mentored the kids through the process, and the crew at Optiver and LinkedIn who volunteered their sweet office spaces in Syd. A very special thanks to the ‪#‎GoogleImpactChallenge‬ for making this possible. The game will be free to download and accessible to all. It's set for release at the end of the year! 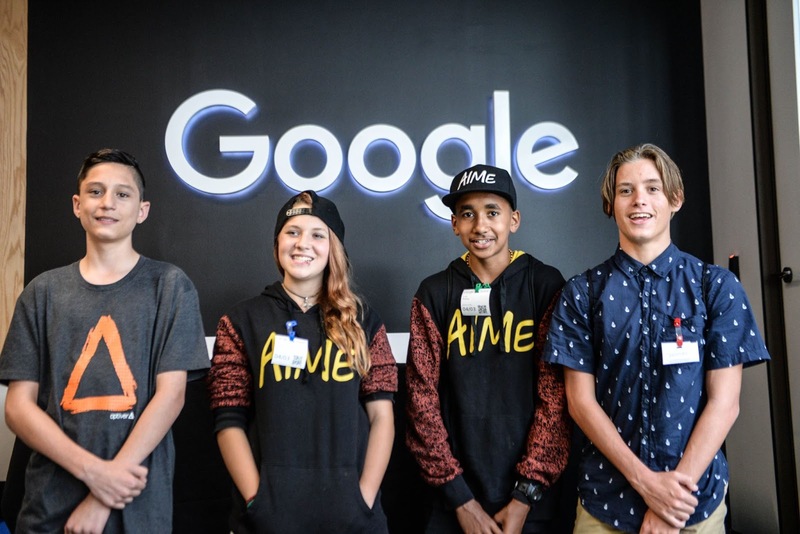 Ed note: This program was made possible after AIME received a $500,000 grant from Google as part of the Google Impact Challenge to develop an immersive online game that sparks the interest of young Indigenous students to learn and excel in maths and science. This is a guest post by Marlee Silva, AIME's first Co-CEO. Last week eighteen Indigenous Year 9 students traveled to Sydney to develop the first STEM-focused video game for Indigenous students, co-designed by Indigenous students. Four teams pitched their ideas to a panel of judges, including reps from Google, ABC Good Game, Mode Games and Western Sydney Year 9 AIME student, Jandamarra Smith. "Second Chance is centered around a student who faces being expelled from school unless he or she agrees to manage the school's soccer team. Each member of the team has two bars which cannot fall below a certain level throughout the game; academic and energy. Energy can be replenished by food but the correct food choices must be made e.g. An energy drink will see the energy source skyrocket but will decrease rapidly, as opposed to choosing a healthier food item for sustained energy."